“Dad, where is the core of the house?” the youngest asked me this morning, as I made his lunch for school. I might’ve answered differently if he’d asked me what, but this was specifically where. Still, I wanted to be sure what he meant, so I asked what he meant by “the core.” It turned out that, as I thought, he wanted to know the location of the center of the house, like the core of an apple. First I had him determine which was wider, the living room or the dining room. He counted off steps and determined the living room was wider. Then he counted the steps across the front hall (such as it is), and then added up the steps from the three spaces. They had been big steps, so it was 18 steps across the house. More steps were taken to measure the house front to back, at which point we figured out that the center was somewhere in the main stairwell. (Also the only stairwell.) But then I threw the curveball: we’d measured the house side to side and front to back. What else had to be measured? So we counted the floors and their heights in our heads, and considered that the roof’s peak was a bit higher than the attic ceiling, but that the attic and basement had lower ceilings than the first and second floors. In the end, we decided the core of the house was probably the step just below the first landing of the stairwell, about two-thirds of the way across it. He sat in that spot, looking pleased and maybe a little smug. Then he slid down the stairs, telling me his head felt weird when he thought about how he was sitting in the exact center of the house. A few minutes later, he’d hauled out the deluxe snap circuit set his uncle had gotten him for Christmas, and was building a circuit of his own making. Once it was completed, we talked about current flows and why the fan went slower and the light came on when he opened the switch, and the light went off and the fan sped up when it was closed. I love talking with him about the world and how it works, because it lets me see the world through new eyes. I felt the same way when I had the same kinds of conversations with his sisters. It’s a cliché that a small child constantly asking “Why?” is annoying and exasperating, but not to me. I never, ever want them to stop asking why. I will always answer their questions, or tell them I don’t know and we’ll find out together. The internet makes that last part much, much easier than in the past, admittedly. I have another reason to always give an answer, though. If I always answer my childrens’ questions, I teach them that questions are okay, that questioning is a good thing. And more importantly to me, I teach them that they can come to me with anything, and be taken seriously. Kat feels and acts the same, thankfully. This has been a real advantage with our eldest, as she moves through middle school and into her teenage years. She knows she can be honest with us. More than once, she’s come to us with serious situations in her peer group, and known that we will listen, take her concerns seriously, and will act as needed. She’s… well, I don’t know if she’s exactly comfortable discussing the biological ramifications of growing up, but she’s able to do so without hesitation or shame. Because she knows I’ll take her seriously, and listen to her, and not tell her she’s wrong or inappropriate. A lifetime of answering her questions about ice and airplanes and the Moon and the color of the sky taught her that. Always listen. Always give an answer, even if it’s “I don’t know.” Always take them seriously. Because one day, that open door may give them a place to go for help and shelter, right when they most need it. This morning, our youngest child Joshua attended his first day of kindergarten. After breakfast and lunch-making and a shoe argument and coffee for everyone but me, we walked up our sun-dappled street to the elementary school together, me and my wife and our son and the empty hole beside him, where his sister would have been. Today was his big day, and Kat and I worked hard to keep it that way. We took his picture on the front porch, as we did for each kid on their first day, and strolled along the sidewalk. We smiled as he shifted his brand-new backpack on his shoulders, getting used to its weight and feel with its folders and crayon box. We ruffled our hands in his first-day-of-school haircut—a Mohawk, at his request—as he assured us that he and his friend M.L. would know everything they needed to do in school, since they’d already learned it all in preschool. We stood with him outside the school’s front door, chatting with parents and teachers as we waited for the start of the day. We headed into the building in a line, eventually splitting off into the kids’ room and the parents’ orientation room. We didn’t talk about our missing third-grader, even to ourselves. We refrained from sharing the looks, the touches, the abbreviated sentence fragments that are painfully clear to us and nobody else. Our kids may not understand exactly what we’re saying in those moments, but they know exactly what we’re talking about, just from the way our jaws stiffen and the dull sharded light in our eyes. We didn’t talk about our hopes of past years, how we’d looked forward to our kids walking to school together, hand in hand. We didn’t talk about the two years we’d been away from the school, years we had expected to be there as each kid moved through the grades. We didn’t talk about the absent eyes that would have shone with pride and protection. We didn’t talk about how we had only made one decaf coffee for the kids that morning, instead of two. Joshua, like Rebecca before him, loves coffee. As long as it’s loaded with milk and sugar, that is. As we got ready to leave the school and Joshua to his day, we gave him hugs. He showed us the work folder he’d been given, a plain Manila folder on which the kids had been asked to draw a picture of their families. He’d drawn us all: Kat, and me, and Carolyn, and himself. And between him and Carolyn, a line. A marker drawn in marker, holding open a place in his family that can never be filled. We told him it was a great drawing, and to have a great day, and held our tears until we were well out of his sight. It’s not fair to anyone, least of all him, that these milestones are so irrevocably tinged. We try, and often succeed, to keep them focused on the present, to take them for what they are rather than what we wanted them to be. And we’re getting better at it as time passes. Better is not perfect, and I doubt it ever will be. But if you’re reading this years from now, Joshua, please know: we were so happy to see you start kindergarten. We truly felt joy seeing you meet your classmates and teachers, and give everyone that sly half-smile you’ve perfected. And we felt pride at seeing that you haven’t forgotten the sister who died when you were so very young, and whose memory you keep alive in your own ways. We may have missed Rebecca, but we didn’t miss seeing you take those first steps into your new school, and we’re beyond grateful that we could be there to see them. In April, not long after we told Rebecca we couldn’t find the special medicine, I heard her crying in her bedroom. I went in to find her with her brother Joshua and Kat. She was sobbing, huddled in Kat’s arms. “Rebecca says she wants Joshua to have her Cinderella’s Castle alarm clock forever and ever,” Kat told me through her own tears. This is the clock that, for a while, is how Rebecca got to sleep, listening to the two stories it could play, one after the other, until she drifted off. She loved to watch the tiny figures of Cinderella and Prince Charming twirl about as cheery music played and the towers lit up with slowly shifting colors. Our five-year-old daughter, a fan of all princesses but of Cinderella above all others, willing her treasured clock to her little brother. I cannot ever describe the emotion that pierced me in that moment. I cannot ever describe the emotion that pierces me in those moments. But I can say that it has helped me start to pierce the numbness I described earlier. Of course it brings tears to my eyes when he wishes Rebecca good night. The first time I saw him do it, I almost completely broke down, only containing myself for fear of scaring him or making him think he should stop. I don’t want him to stop until he moves beyond it naturally. What that pure moment of love made me realize, to my horror, is that I had stopped saying those things. I had stopped saying I loved her and missed her, because she was gone and there was no point. But there was a point, all along, and I (perhaps understandably) overlooked it in my grief. The point is that I can still hear those words, and in hearing them, feel what they mean and what we have lost. So every so often, when I have a few moments alone or with Kat, I say the words: I love you, Rebecca. I miss you, Rebecca. It isn’t enough to think them (or type them, for that matter). I speak them, in a whisper or a normal tone or whatever voice seems right. It becomes a miniature elegy. A way of slowly, slowly, slowly coming to terms with her death. Saying the words brings tears, sometimes just a few, sometimes a few minutes of them. Each tear brings me a tiny step closer to acceptance. I know it will take a long time, but this small ritual, taught to me by my three-year-old son, keeps me on the path. I love you, Rebecca. I miss you, Rebecca. Yesterday morning, in a small office on the second floor of the Cuyahoga County Courthouse in downtown Cleveland, Ohio, Kat and Carolyn and Rebecca and I finalized our adoption of Joshua. There were a few witnesses to this: the social worker who has handled our case from the outset, as she did Carolyn’s; the lawyer who made sure all of our paperwork was correct; my sister and father and stepmother; our friends Gini and Ferrett and Jim; and the magistrate who conducted the proceedings. 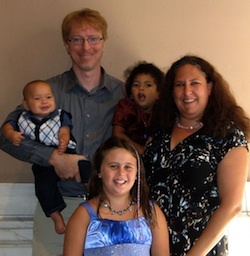 As with Carolyn and Rebecca, I haven’t talked about Joshua being adopted—not that it was any big secret, given our having adopted our other children. Nevertheless, I did this for the same old reasons: for the past seven months, we’ve been borrowing him from his legal guardians, the adoption agency. The usual monthly checkups from our social worker still occurred, and there was still the theoretical possibility of Joshua’s placement being revoked for any reason whatsoever. Or even for no reason at all. I had no way to know if a blog post might somehow make things more difficult, so I left it alone. All this was always a basically theoretical possibility—there was no real fear of it actually happening—but now, even the theory is undone. Joshua is now legally our son and the girls’ brother just as completely as he has long been both in our hearts. He is now ours—but even more than that, and far more importantly, we are now his. Over a celebratory lunch, Kat held our sleeping son in her arms and I cradled his head with my hand as we whispered our love for him, for our girls, and for each other. Kat and I are now triply parents. Earlier today we welcomed Joshua David Meyer into our home and our hearts. We’ve had this name ready ever since we started out to build a family almost a decade ago. We chose Joshua to honor Kat’s late aunt Judy, an incredibly strong and brave woman who faced adversity with a smile. The middle name, David, honors Kat’s grandmother Dot and is also the name of one of my best and oldest friends. Carolyn and Rebecca are both incredibly excited to have a baby brother and are helping take care of him (and us) as much as they can. I’ll obviously be a bit distracted during the settling-in phase of having a newborn in the house, but with any luck I’ll manage to get a few things out the door during naps.